vanilla extract (gluten-free), originally uploaded by shaunaforce. Before I begin the parade of Thanksgiving recipes, I want to pause and comment on vanilla. 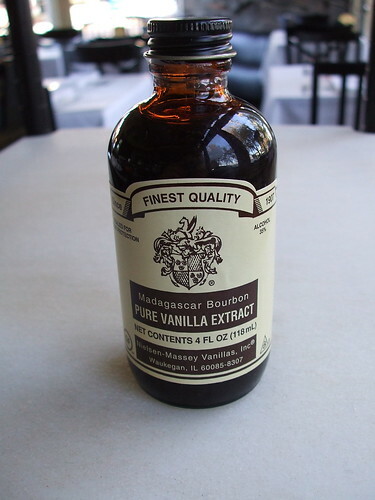 Good vanilla extract is essential to all the holiday baking we will be doing this next month. When I went gluten-free, I panicked about my vanilla extracts. Most of the literature out there seemed to suggest that I could never use vanilla extract again. If the distilled alcohol used to make the vanilla extract came originally from grains I could not eat, then that vanilla extract would make me sick. I searched for organic brands that labeled themselves as gluten-free. They weren’t always that good (more well-meaning than full of flavor), but I felt safe. Since then, I have realized  and many would back me up on this  that the belief that pure vanilla extract could have gluten in it smacks of old thinking. In the past few years, scientists have tested grain alcohols and found that even those made from wheat, rye, and barley are gluten-free after they have survived the distillation process. Thus, I can drink Scotch, even though it is made from those terrible grains. When I discovered this last December, I had myself a celebration. The same seems to be true for distilled vinegars. For decades, the common truth was that anything with distilled vinegar was unsafe for those of us who have to eat gluten-free. In fact, the first six months after my celiac diagnosis, I assiduously avoided anything with distilled vinegar. Now, however, it is becoming more and more clear that distilled vinegars  even those distilled through wheat, rye, and barley  are safe for celiacs. Rejoice. Of course, the more awareness, the more research will be done. And, I think, the more we will find we can eat. Since the distillation process in hard liquor and vinegars seems to kill the gluten proteins in the final product, it is safe to assume that the same is true for vanilla extract. Therefore, it should be that all vanilla extracts are gluten-free. Don’t quote me on it. Try it for yourself. But that makes sense to me  and plenty of others out there. If you would like to read a great piece on the different types of vanilla and their uses in baking, check out David Lebovitz’s piece from last year. The man knows. Me? I’ve become overly partial to this bottle of vanilla extract: Nielsen-Massey’s Madagascar Bourbon Pure Vanilla. Smooth and sweet, with little hints of something deeper, this vanilla enlivens every baked good I make. And with Christmas season  and my gluten-free sugar cut-out cookies  approaching, I made sure I am stocked up right now. This company, which is one hundred years old this year and based in Illinois, works hard at gathering the best vanilla from around the world: Madagascar, Indonesia, Tahiti, and Mexico. They also have a vanilla bean paste that Joycelyn at the ever-beautiful Kuidaore swears by for her exquisite creations. That’s enough for me. Even better, this summer Nielsen Massey was the first major ingredient supplier in the United States to be certified gluten-free. Any company that has Cynthia Kupper’s stamp of approval is all right with me. Better yet, the taste. Oh my  I emit a low moan. So, if you want to feel safe that you are using gluten-free vanilla products, and fold the best-tasting vanilla extract into your baked goods for Thanksgiving, go pick up a bottle of this. You won’t regret it. I LOVE vanilla! I usually end up putting more in than is called for! Hi! I’ve been reading your site since I saw the Food Network spot, and this post induced the delurker in me. I’m so glad that you denounced artificial vanilla. I was on the verge of running out of my vanilla extract last week, so I added “vanilla” to the grocery list. My husband went shopping and the next day, I thought, “Why is there hydrogen peroxide on my baking shelf?” Oh, no, it’s a giant bottle of imitation vanilla. Gah. I ran out and replaced it the next day, with no word to the husband. Oh, and on a different note – I passed along your site to a co-worker who has two kids who are allergic to gluten, and he is a big fan. You are making a huge difference for a lot of people, gluten-free or not. Thank you! I have been reading your blog off and on since it was mentioned on the celiac listserv. I love that you embrace the joy of life and all the positive aspects of being celiac–that’s my philosophy as well. I lead a small celiac/gluten intolerance group. I make my own vanilla. I order vanilla beans from Penzey’s. I split two in the middle (not splitting all the way through the ends) and place them in a small bottle of vodka. (I believe you can use any liquor, so you might be able to make your own version of the kind you like using Madagascar Vanilla Beans and bourbon.) You will have vanilla extract in about 4 weeks. It gets better as time goes on. I have even soaked the label off, put my own label on, tied a ribbon around the neck, and given these as gifts. My fellow bakers (celiac and non-celiac) love getting my homemade vanilla. Just thought I’d share the idea. I will save this site in case I run out of vanilla extract and can’t make a batch soon. Didn’t want anyone to think Liquor alcohol was the norm used to produce this delectable pantry staple. I agree NM is the finest with the deepest most layered vanilla. The term “Bourbon” is a geographic reference to the Bourbon Islands, Madagascar, Comoro, Reunion, Seychelles and Mauritius, off the east coast of Africa. In the 1800’s, they were ruled by the French, whose ruling family at the time were the Bourbons. NM Vanilla uses %100 corn alcohol. So drink up, splash up, and mix up with no worries. Vanilla is my favourite thing to add when I bake. I didn’t realise growing up in North America that it is not used as much in other countries such as the UK, Germany and France. Here in the UK vanilla comes in tiny little bottles which will make about two batches of cookies. So when I am home I buy industrial sizes of pure vanilla extract. People think I am crazy, but as we all agree, it tastes so much better! Thanks for giving me lovely things to think about right before bed! Mmmm… Vanilla is one of my favorite scents (I’ve been known to dab a bit of vanilla extract on my pulse points), and high up on my list of favorite flavors. It is almost time for holiday baking, which will be interesting with a new oven. I hope our kitchen will smell more like vanilla than like burning! I’d like to pass on Patricia Rain’s website. AKA The Vanilla Queen. She’s done an immense amount of hard work to make sure Vanilla remains a sustainable commodity. Also, if you’re in the reading mood, may I suggest The History of The Senses or The Artful Eater Check out the chapters on vanilla. History that will make you blush. I love your blog, Shauna! Your photos are sumptuous and your words are so heartfelt. Also I love hearing about what’s going on in Seattle, I lived there for 16 years and miss it madly. I will definitely go to Impromptu next time I am in town! Isn’t vanilla amazing?? One of those magical, primal flavors. My favorite use is in poached pears, a whole split bean simmered with sweet white wine and not-quite-ripe Anjous and slices of ginger, served warm with ice cream. Holy delicious dessert Batman! hi shauna, gorgeous post, redolent of the scent of top drawer vanilla 😉 it’s awesome that you can safely use a product like nielsen massey’s – they rock! Shauna – that’s my favourite vanilla extract, I think I’m using my 3rd bottle already:) I haven’t tried their vanilla paste yet, but will surely pick up a bottle when I see one next! You have such perfect timing. I about ran out of my vanilla and put it on my list for more. I read this blog post and yesterday went shopping. Now, I usually buy my vanilla in the health food section that states it’s gluten-free. I wandered over to the regular spice isle looking for something else, when lo and behold, THERE was this vanilla. And cheaper than the one I usually buy!! You totally ROCK!! I can’t wait to try it out. Thanks for the info as I would have NEVER purchased a product that didn’t say it was gluten-free!! I just had to pop over to tell you my good news!! Where did anyone get the idea that any Vanilla extract has gluten in it? I fear the GLUTEN in some vinegar and wine may come from wooden barrels it was aged in, because they were sealed with raw wheat paste.. My understanding is the most wooden barrels are not made of such fine wood that it would be leak proof (hence the wheat paste).. I do not know how true this is; read it while trying to determine what wine was GF.. It should be safe to drink white/silver tequilla (IE: the caramel coloring typically means it was in a wooden barrel)..
Just thought I would put this out there. Acidic foods are known to cause the same symptoms of celiac disease in celiac's. OJ can tear you up, even if it is gluten free, the same with vinegar. Especially when your gut is not healed. That may be part of why vinegar gets a bad wrap. It is just the acid and the damaged intestine not mixing. Nothing to do with gluten at all. It’s been six years since diagnosed with Celiac, and the old school beliefs regarding distilled vinegar, vanilla extract and even alcohol made from grains have been proven gluten-free. When my father was diagnosed with Celiac twenty years ago, it was a very new disease and there were theories about gluten, not all of which were accurate. The distillation process has been proven to remove all traces of grain and gluten. I was under the impression that it was the artifical coloring that could make it unsafe. I know it can make me sick. If you’re using real vanilla, you don’t need to worry about artificial coloring because there won’t be any. I just had a bad experience with imitation essence hubby brought home – the caramel food colouring (150) can come from wheat and i got caught out big time. So definitely back to the pure stuff for me. All store bought extract are made with watered-down ethanol-the stuff that people make in their back yards. It is basically moonshine and is very hard on ones digestive system. Even though the flavor of the alcohol is baked off the constituents are not. As well as all store bought bought “PURE” extracts contain sugar (yes NM does as well). You can find extracts that don’t contain sugar in some small gourmet shops and on the inter-web, but you are still dealing with a harsh alcohol base. The other thing about industrial extracts is the quality of vanilla they use. They might advertise that they are sourcing only the best vanilla from around the world, but that is just not true. They are sourcing the best vanilla for their purposes which is the cheapest. The FDA has no guidelines on the quality of vanilla used only the amount of vanilla per gallon of ethanol. This is how they are able to call their product “PURE” even though they contain other ingredients. By making your own, you are able to use a better quality of vanilla bean as well as a better quality of alcohol. There is a reason that certain brands advertise that they are triple distilled. Each distillation process purifies the alcohol; so it is easier for our bodies to process. And remember-DON’T BE SKIMPY! !-Use at least 4 beans per cup of alcohol. Shake once a week and wait for at least 4 weeks for a good quality. I’m not on a gluten-free diet but I have family who are. I’m trying to make desserts for them for an upcoming party. I never would have thought to check my vanilla for gluten. But, I am lucky- the bottle that I purchased at Sam’s Club is labeled gluten-free. It’s Tone’s brand. I bought it because it was very inexpensive for the size bottle. It was about $4 for a pint.